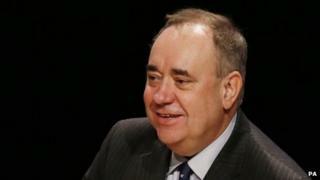 First Minister Alex Salmond has arrived in China for a short visit which is intended to promote trade and governmental links. The mission will advance "the deepening friendship between Scotland and China". Exports from Scotland to China are reported to have increased from £265m in 2007 to £498m in 2012. A 30-company trade delegation associated with the visit will highlight oil, gas, construction and life sciences. The visit will conclude on Thursday with a speech by Mr Salmond to the International Financial Centres Forum on financial services and Scotland's place in the global economy. Ahead of the visit, Mr Salmond said: "It is hugely important that, in an increasingly global economy, Scotland is able to engage with international economic giants such as China, identifying further opportunities for our innovative companies to export their expertise and high-quality products and drive sustainable economic growth at home. "The trade mission I will convene in China this weekend will focus on two crucial industry sectors." He said: "high-level government, education and trade talks" would examine opportunities for Scotland in the oil and gas and construction sectors "as well as wider opportunities around strengthening education links that are already bringing great benefits to both countries". "I will deliver two keynote economic speeches, examining Scotland's place in the world and the challenges nations in the east and west face in building a sustainable and balanced economic recovery," he added.